**SELLER IS CURRENTLY UNDER A MULTIPLE OFFER SITUATION AND HAS REQUESTED ALL TO SUBMIT THEIR HIGHEST & BEST OFFER NO LATER THAN 11:59 MST ON WED 11-21-18. Bank owned home on large half acre plus lot where horses are allowed. This home has an additional bonus room behind the garage with bathroom adding 560sf. 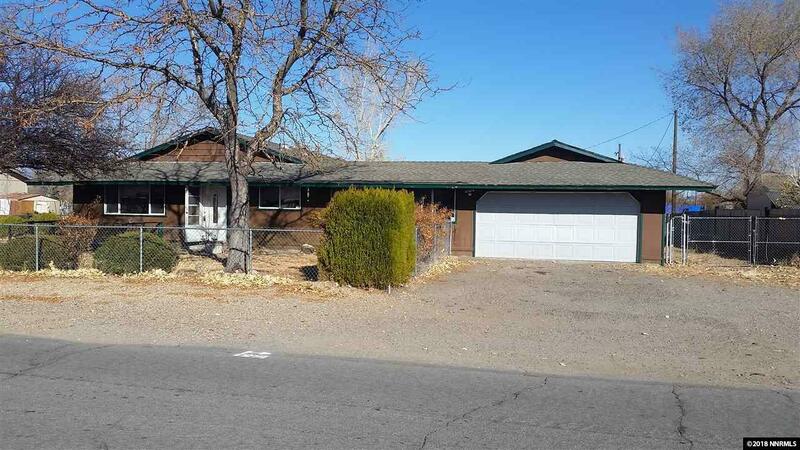 3 bedroom, large living room, two full bath, office off of kitchen. Breezeway between the main home and garage was enclosed, adding another 336sf bring the total sqft to 2560(buyer to verify). Listing provided courtesy of Beverly Realty. © 2019 Northern Nevada Regional Multiple Listing Service® MLS. All rights reserved. Information is deemed reliable but is not guaranteed accurate by the MLS or Marshall Realty. Real estate listings held by brokerage firms other than Marshall Realty are marked with the BROKER RECIPROCITY logo or the BROKER RECIPROCITY thumbnail logo and detailed information about them includes the name of the listing brokerage. The data relating to real estate for sale on this web site comes in part from the BROKER RECIPROCITY Program of the Northern Nevada Regional MLS and is for consumers' personal, non-commercial use and may not be used for any purpose other than to identify prospective properties consumers may be interested in purchasing. Data last updated: 2019-04-25T10:19:42.003.